Lady of surprises – you might be small and delicate, but you hold immense power and unmatched beauty. Your flirtatious fragrance has been the signature perfume of queens and regal women for ages. And you have also been the emblem of powerful warriors and important cities. The modern terms “pansy” and “shrinking violet” fail to recognize the power that lies in your humble presence. Other names: Viola spp. hearts ease, wild pansy, Johnny jump up. 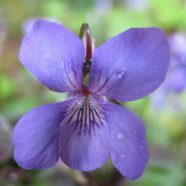 Identifying Violet: There are many kinds of violets in the northwest. 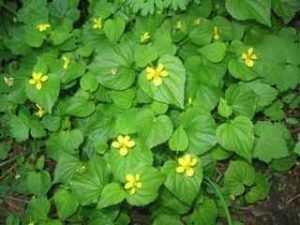 All are low growing plants with heart or kidney-shaped leaves. Flowers have five petals arranged with two upper, two middle, and one lower petal, which is often larger. Wild violets include Viola adunca (early spring violet), Viola langsdorfii (Alaska violet), Viola palustris (marsh violet), Viola canadensis, (Canada violet), Viola galvella (stream violet) and Viola sempervirens (trailing yellow violet). A European and Asian native called Viola oderata or sweet violet has very fragrant deep purple flowers. It commonly escapes from gardens into wild spaces. To make identifying violet even more confusing, violets will readily cross with each other. Luckily, all violets are edible and are used for medicine interchangeably. Try tasting your local variety and getting down on your hands and knees to smell the flowers. It is worth it when you find one that is fragrant! Where it grows: Violets grow on all continents. There are 900 species worldwide with over 120 species cultivated as ornamentals. 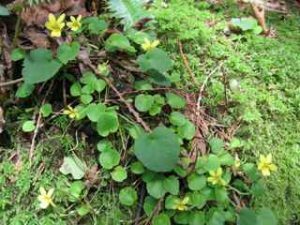 In the Northwest, native violets tend to grow in moist, shady forests. Violets have gone to all ends to attract early insects and get their flowers pollinated. Lower petals have bright lines that glow like landing strips for bees or butterflies. The mouth of the nectary is guarded by two modified stamens that deposit pollen on visitors when they crawl into the flower. Combs on the bottom petal gather pollen that has been transported from other violet flowers off bee bellies. But violets have devised an ingenious back up plan for reproduction in case they bloom too early for pollinators. Small greenish flowers grow in late summer under ground or at the soils surface. They do not open, and are self-fertilized. Some violet seeds have outgrowths called oil-bodies that ants carry off for food and disperse at a distance from the parent plant. Violets also reproduce by throwing out runners that set roots and become new plants. You will rarely see violets growing in dusty places or where there is poor air quality. The undersides of the leaves have tiny hairs that get covered with debris and block the plants breathing pores. When and How to Harvest: Gather violet leaves and flowers in the spring to early summer when they still look vibrant. Pinch off leaves and flowers gently, making sure to leave enough of the plant so that it continues to flourish. 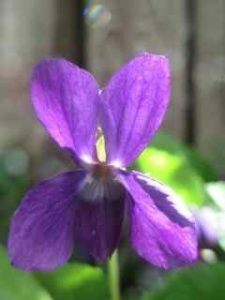 Many wild violets transplant well and will flourish in shady areas of your garden. If you miss violets at lower elevations you can travel to higher elevations in summer and find them in mountain forests and meadows. 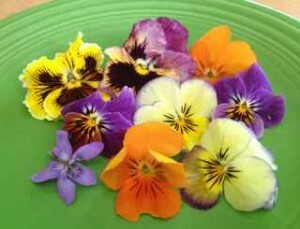 All violet leaves and flowers are edible, including their close relative, pansies, and Johnny jump ups. According to herbalist Janice Schofield, just two violet leaves fulfills our daily requirement for vitamin C! 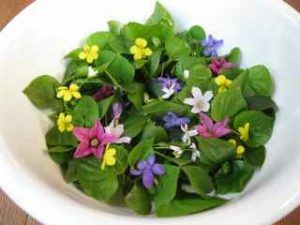 Violet is a nutritious spring trail snack and can be added to salads, soups, sautés, sauces, and whatever else your imagination comes up with. You can brush egg white on the flowers, carefully coat them in confectioners sugar, then bake them in the oven on the lowest temperature to make candied violets. Caution: Wild violet leaves contain saponins or soap-like compounds, which can cause digestive upset when eaten in very large quantities. Do not eat more than a handful at a time. This delicious spring salad is packed with nutrients and bright floral flavors. Toss the flowers and greens in a bowl and pour the dressing over just before serving. You can substitute lettuce for chickweed or spring beauty. Dressing: Mix 2 tablespoons of olive oil with 1 tablespoon of light vinegar (white wine, or rice wine), 1 tablespoon of orange juice and 1 tablespoon of fresh mint or 1 teaspoon of dried mint. Place ingredients in a jar and shake vigorously. Add salt to taste. This year I was inspired by my friend Corinne Boyer’s delicious violet syrup. 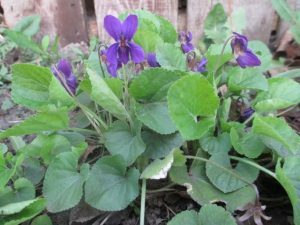 Together we adventured to an old homestead in mid February to gather the fragrant purple flowers, which are probably a cross between Viola odorata and wild violets. 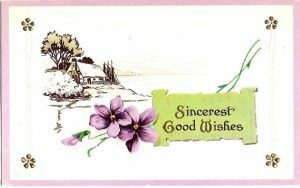 We often see violets around old homesteads. I believe they were planted by hardworking ladies to bring beauty and grace to their days. These women left their signature of who they were and what was important to them through the plants they tended. It was a typical early spring day with intense rain followed by sun breaks, a rainbow, and a hail storm. My fingers were freezing and I was soaked, but the taste of violets on my tongue encouraged me to fill my basket. That little bit of violet we gathered was transformed into syrup, brandy and cordial that I am still savoring! 1. Gather fragrant violet flowers when they are in full bloom. This is usually in February through April. 2. Place the flowers in a basket or on a cloth and let them wilt until they are half dried. 3. Place the flowers in a teapot or sturdy glass container and cover them with boiling water so they are just covered. Cover with a lid and let steep for several hours. 4. Strain the tea through muslin cloth, making sure to squeeze all the precious juice out of the flowers. Purple flowers will make an intensely purple colored tea. 5. Measure the volume of the tea, then measure an equal volume of sugar. I use raw sugar, but white sugar will also work fine. You beautiful purple syrup will turn a pale green blue, but it will still taste delicious. 6. Mix the tea with the sugar until the sugar dissolves. You may need to heat it so the sugar dissolves completely. 7. Pour into a glass bottle, cap, label and store in the refrigerator for several months. This syrup can be used on pancakes, in desserts and to flavor drinks. I also made violet brandy by placing brandy over the flowers in a glass jar. I let this sit for 2 weeks, then strained it out. 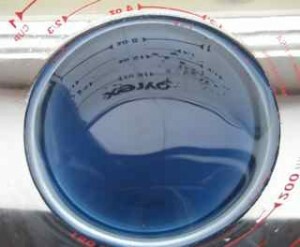 I mixed equal parts violet brandy and violet syrup to make a violet elixir. All I can say is I am smitten. The leaves of violet are high in mucilage that sooths irritated tissue. They contain salicylic acid, which helps reduce pain and swelling. About 400 years ago, herbalist John Gerard summarized traditional European uses of violet when he wrote that “It has power to ease inflammation, roughness of the throat and comforteth the heart, assumageth the pains of the head, and causeth sleep.” I still concur. Lower Elwha Klallam People traditionally placed mashed flowers on painful areas. Many other people throughout the world have used violets for bruises. I was convinced of their healing power when a friend closed her finger in the car door. After she got her wits about her, she saw that pansies were growing near by and she crushed several leaves and flowers to make a poultice. The pain backed off quickly, and there was no trace of injury the next day! Violet leaves and flowers have been used historically for the treatment of cancer and swollen glands. The tea of the flowers, leaves, and sometimes the roots is used internally to help dissolve tumors and relieve congested tissue. Herbalist Alma Hutchen says that violets’ dissolving properties “seem to have intricate inward skill, reaching places only the blood and lymphatic fluids penetrate.” Herbalist Susan Weed uses violets internally as a tea and externally as a poultice to help heal fibrocystic breasts, breast cancer, and mastitis. Violet has also been used in Native American and Chinese medicine for cancer and for shrinking tumors. The action may be partly due to steroidal saponins found in the plant, which have a dissolving action that can increase the transfer of nutrients across cell membranes. Dry violet leaves and flowers in baskets or paper bags. Once completely dry, store in a jar or bag in a cool dark place. Use 1 tablespoon of dried leaf and flower per cup of hot water. Infuse for 10 minutes to several hours. Drink 2-3 cups a day. The wilted flowers of fragrant violets can also be made into the most flavorful honey! Simply wilt the flowers so they are about half dry, place them in a jar, then cover the flowers with warmed honey. Cover with a lid and place in a warm place in your house. Near a wood stove or heat vent works well. Every couple of days open the lid and wipe off any condensation that has formed. After 2 weeks, gently warm the honey, then strain it through muslin cloth. Store in a glass jar. Honeys will last several years as long as there is not too much water in them. You can make violet infused oil in the same way. I prefer to use jojoba, grapeseed or sunflower oil instead of extra virgin olive oil because they do not have a smell that masks the violet. Non-fragrant violets also make a nice soothing and anti-inflammatory oil that can be used in body oils, salves, lip balms and lotions. Violet has been prized throughout history for its aroma. It has a flirtatious scent that tantalizes the senses and then disappears without a trace, only to return again with renewed strength. Because of this, courtesans of ancient Greece used violet to scent themselves. It is said that violet can alleviate the melancholia of the eldest men and torment the young beyond endurance! At that time a perfume was made through placing violet flowers between thin layers of fat, which absorbed the scent. After straining the flowers, the fat was used as perfume. Violet perfume is currently made through using solvents to extract fragrant compounds from the leaves and flowers. Violets have been associated with grieving and death since ancient times. They were traditionally worn at funerals where they were thought to guard people against the poisonous fumes from the cemetery. I have sought violets medicine in times when my heart is wilted with grief. Like a steadfast friend and a loyal guardian, it has carried me out of isolation and engendered openness and beauty at that membrane between life and death. The city of Athens took violet for its symbol and the plant was for sale year round in markets. Ancient Greeks also used violets “to moderate anger, procure sleep and comfort and strengthen the heart.” Violet wine was a delicacy for ancient Romans. Napoleon loved violets above all other flowers, perhaps because it was the signature perfume of his wife, Josephine Bonaparte. During Napoleon’s exile his partisans wore violets to identify themselves to each other. French law prohibited public display of art with violets for more than half a century. Because violet imparts its sweet odor and vibrant color to liquids, alcohol or vinegar extractions, they were once used to flavor and color foods and beverages. Violet syrup was commonly sold in France, and you can still buy old-fashioned violet pastilles and syrups. I love to go to DeLaurenti, the Italian grocery at Pike Place Market in Seattle, and buy candied violets and violet pastilles. What a treat! Get notified when the next blog is posted!